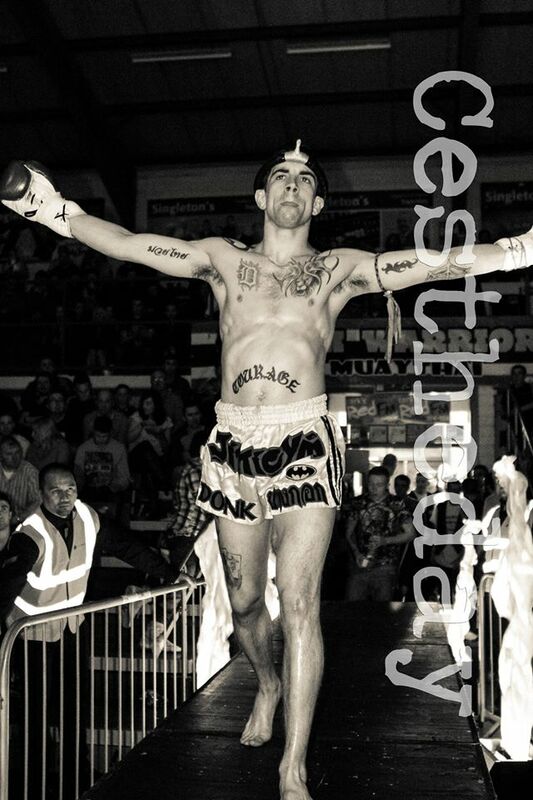 James O’Connell from Courage Thai (Clonmel, Co.Tipperary) (I.S.K.A Irish Featherweight Champion, IMC Irish Featherweight Champion, IMC Irish junior Featherweight Champion, Celtic 4 nations Featherweight Champion) talks to Muay Eireann about his incredible title fight with Aaron O’Callaghan on the last Siam Warriors event in Cork and also about his upcoming WBC Lightweight International challenge bout against Anthony Ferguson from Renegade Gym UK (WRSA World Champion, EKBF European Champion). The fight takes place in Milton Keynes UK on the 29th June 2014. A potential fight with myself and Aaron was talked about on Muay Thai forums for years but could not happen because of politics within the sport, we were both fighting for different organisations so the fight could not happen at that time. A lot of people said it would be a dream match , two top dogs from two different organisations and both Irish Champions, it was a fight that had to happen. I felt personally that the Irish titles I had won before would mean nothing unless the fight with Aaron was made. I was delighted when it did happen as It was always a dream of mine to fight on a big show at the Neptune Stadium as I was a spectator there for years when the big shows started. Although it was such a huge fight my emotions and everything were the same as they have been for all my previous fights. It’s a hard thing to explain but I do not get nervous before fights, simple reason is all the hard work is done, training camp over and I’ve made weight so I try to enjoy the buzz of fight day because it goes so quick, fights over before you know it. I do get sick of waiting around though but the shows in the Neptune are great, always run smooth with no delays. But the closer it came to the fight the more angry I got, I am moody anyway but before a fight I would warn anyone to be careful. Going into this fight I knew myself that I was going to have to go to hell and back to get the win or even just to survive. Myself and my trainer Wally had prepared for the worst and even had a little chat between us beforehand. I told him that I knew I was going to get cut, beat up, and be in a war, but I said to him no matter what happens in there your not to stop the fight. I did not care about been cut or broke up after the fight, its what I signed up for at the end of the day, if your worried about getting cut as a pro fighter then you’re in the wrong game. 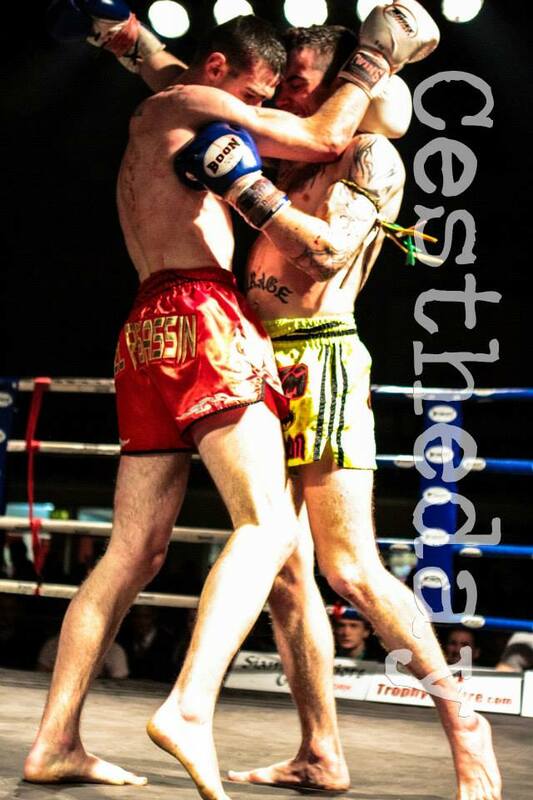 So we were agreed that the referee was the only person allowed to stop the fight or if I got knocked out of course. When the fight started I did not think I was going to be cut as early as I was but Aaron is on a different level when it comes to throwing elbows, but it drove me on more along with the crowds reaction to the fight. I knew all along that it was going to be a great fight and it was a fight I wanted to happen so bad because I like to fight, I like to stand my ground and fight it out and so does Aaron and we proved it, we didn’t take a step backwards and we gave the crowd exactly what they came to see. During the fight there were times I could not hear anything, I couldn’t hear the bell, I couldn’t hear instructions from my corner or the referee, it was crazy. It’s great that we made a bit of Irish history, showed how far the sport of Muay Thai has come in this country, you know you have done something good in the ring when fighters that you used to watch and look up too call you crazy and people are saying it was one of, if not the best Irish Muay Thai fights they had ever seen. That fight will go down as my best experience in my career so far, before during and after the fight, its something I will never forget. The reaction since myself and Aaron went to war on the Siam Warriors super show has been incredible, I got a lot of notice compared to what I was getting this time last year. I kind of knew that getting a win against Aaron would open windows for me but I never expected that off the back of that fight my next fight would be for a WBC International title so it was a surprise but it was a great surprise. And when I got the word the hunger to fight again was back because my next goal was insight. I am just taking everything as it comes, if everything goes to plan and I bring that title home with me then I am sure other windows of opportunity are going to open for me, you never know what is around the corner in this game. A WBC title is the holy grail of any other title there is if you ask me, I think its the most recognised title in the world, it’s every fighter’s dream to fight for a WBC title and it’s a huge honour for me to even get the chance to fight for one. It’ll be a dream come true to bring that title home with me the end of June. 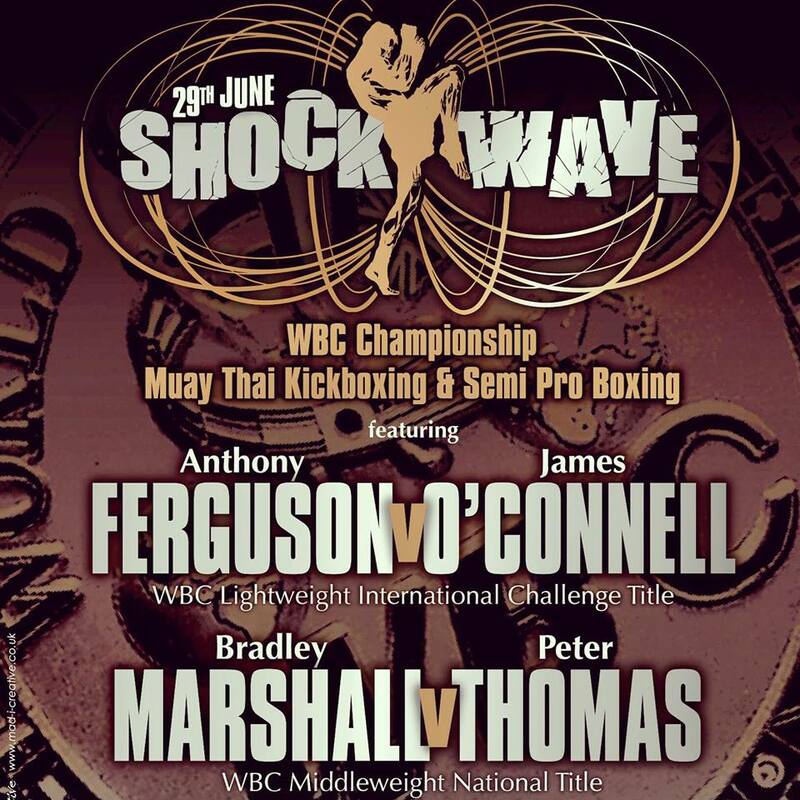 My opponent for the WBC title, Anthony Ferguson, has been around the game a long time now and I’ve seen Anthony fight a good few times over the years. He has been in the ring with some great names, Davy Mac, Shane Cadagan and Stephen Meleady.The very first time I saw him fight was against Stephen Meleady up in Dublin, I was still only fighting novice at the time. I honestly do not know what to expect in this fight as Anthony has fought in a wider range of Martial Arts than I have, he’s fought Muay Thai, K1 and MMA but I think it makes for a great clash of styles, which usually always end up in a great fight. But I’ll certainly be ready as I always expect the worst in fights so I try to prepare for the worst, I’ll have everything covered the best I can. The fight is on Anthonys home soil in England, the venue is not too far from where he lives which is always a bonus and I am sure he’ll bring some great support with him, I’ll have a few fans following me over also but its not the same as fighting at home. That said, I have fought overseas quite a few times now, I’ve fought in Thailand, Scotland and England and to be honest I prefer being the “bad guy“ in the ring, some fighters get nervous when the crowd is 100% behind the other fighter but it just drives me on more in a fight. I’ve trained really hard for this fight but training is always tough, at this stage of my career I know what I need to be doing when it comes to my fitness. I’m always trying to improve my game by trying new things, I think it makes the weeks go quicker when you add something new to your training and see yourself improve on it over the weeks coming up to the fight and seeing what it will add to your arsenal on fight night. I am the only active fighter in our gym at the moment but we do have a few lads coming through to watch out for in the novice ranks. 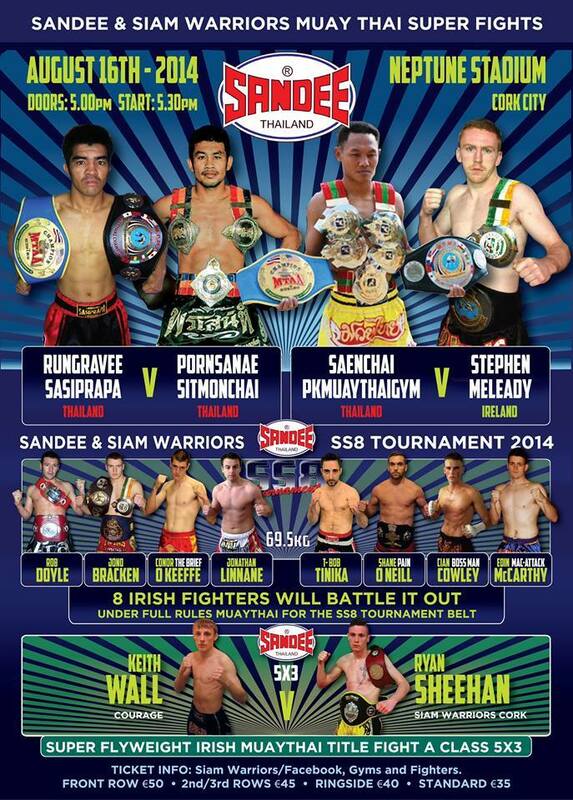 On the next Siam Warriors super show in Cork the one to watch out for is my fellow training partner Keith Wall. 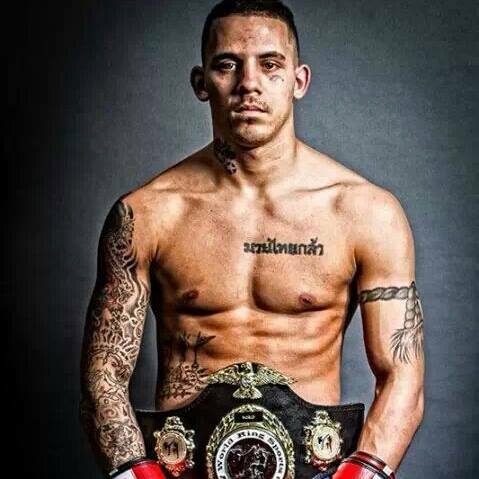 I remember the 1st day he walked into the gym and I have seen him evolve into the great fighter he is today and everyone else is going to get to witness it in his debut on the 16th of August, he’s fighting for a Irish title against another young talented fighter for Siam Warriors Ryan Sheehan and believe me, this fight is one not to be missed. A lot of people have said to me, and not just from my own gym but from around the country that I inspired them after the war myself and Aaron had. But what everyone has to remember is that 8 years ago I was a beginner and just starting off. I was going to the gym and training twice a week, going to shows thinking I’ll never get into that ring. Then I sit back and look at where I am now and it has been a hard tough road and some people would not be able to endure what I have but there is something in some of us that when we set our minds to what we want we can go out and get it. So my advice to anyone in this sport is if you are willing to go through hell and back to get what you want then you are already half way there.